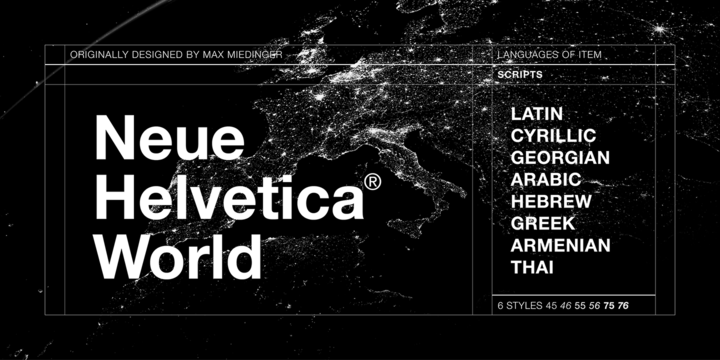 Neue Helvetica World is the World version of the most popular typeface in the world, Neue Helvetica. Created by Linotype Design Studio and published by Linotype, is available in 6 styles (45 Light, 46 Light Italic, 55 Roman, 56 Italic, 75 Bold, 76 Bold Italic), useful OpenType with TrueType (.ttf) or PostScript CFF (.otf) outlines, over 1700 glyphs and multilingual support. This sans serif typeface is perfect for business text, magazine, newsletter, signage etc. Have fun! A font description published on Friday, December 15th, 2017 in Fonts, Linotype, Linotype Design Studio by Alexandra that has 2,222 views.